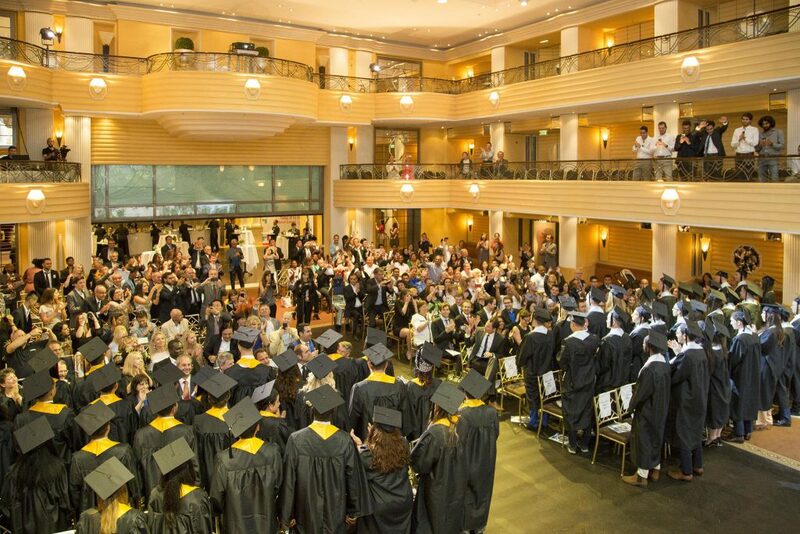 EU Munich’s class of 2017 gathered at the Hotel Bayerischer Hof, a five-star luxury hotel in the center of Munich, to commemorate their academic achievements and to celebrate the coming of a new chapter. This was EU Munich Commencement 2017! 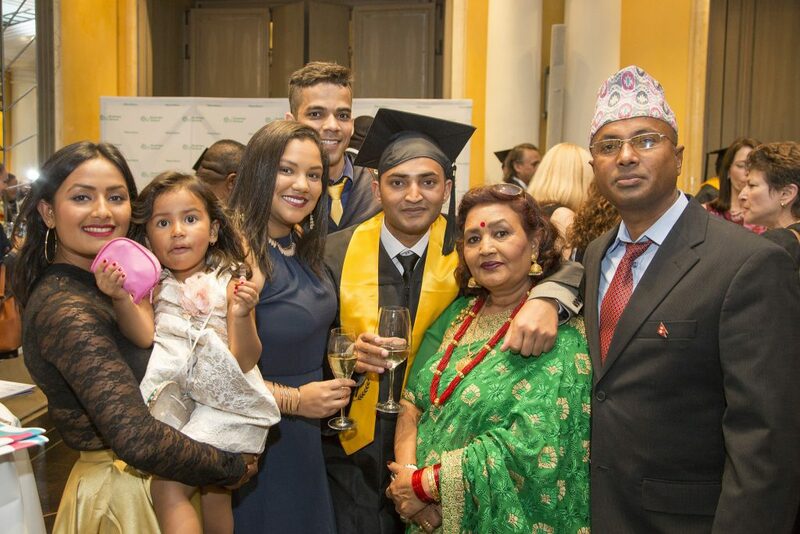 Family, friends and faculty were in attendance, in order to honor and support students for their hard work. Everyone arrived two hours before the ceremony was due to begin, soaking up the atmosphere and settling the pre-show nerves. A dress rehearsal ensured the smooth running and efficiency of the commencement ceremony. Shortly before 5 p.m. students were ready for the procession and they entered in timely fashion, to the sound of Edward Elgar’s Pomp and Circumstance. Firstly, Andre Schlipp, COO of EU Munich, welcomed students. 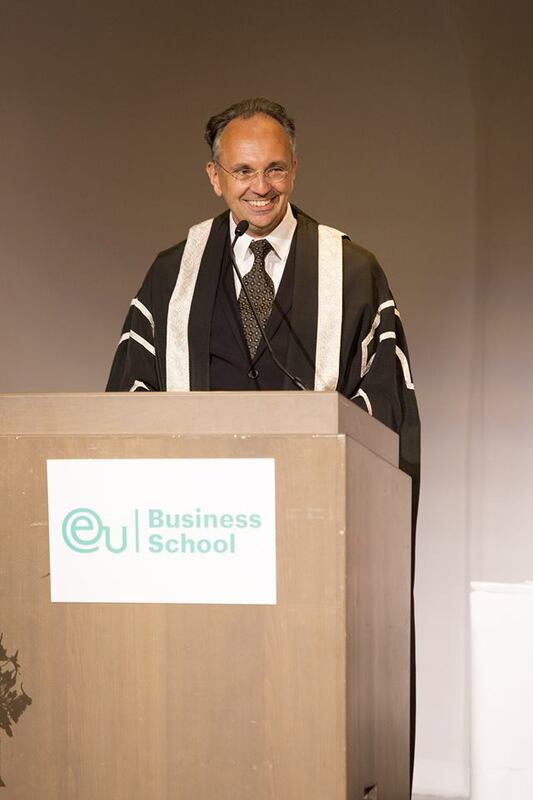 Following the commencement address from Kai Fredrich, CEO of Consorsbank & DAB BNP Paribas, EU Munich’s Dean Dr. Begoña González Otero and President Dr. Dirk Craen gave speeches. 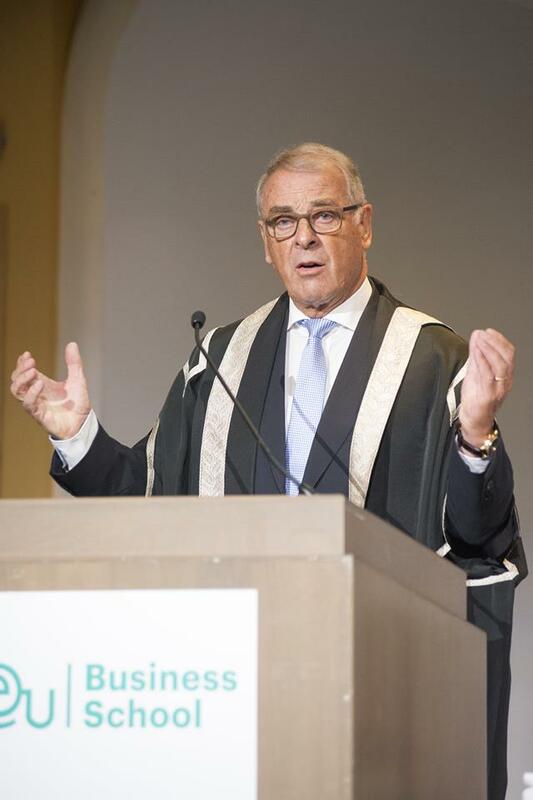 Next, the former President of the Swiss Confederation Dr. Adolf Ogi, gave a special address. Then came the presentation of special EU Awards. Sixt received the EU Family Business Award, Betina Mazzarino and Flor Puppio, founders of the PWN (Professional Women’s Network) Virtual Entrepreneurship program won the EU Leadership award, Pierre Robio accepted the EU Sustainability Award on behalf of the Republic of France, Consorbank were awarded the EU Corporate Sustainability Award and SCA received the EU Social Responsibility Award. Next, the moment students had been waiting for. 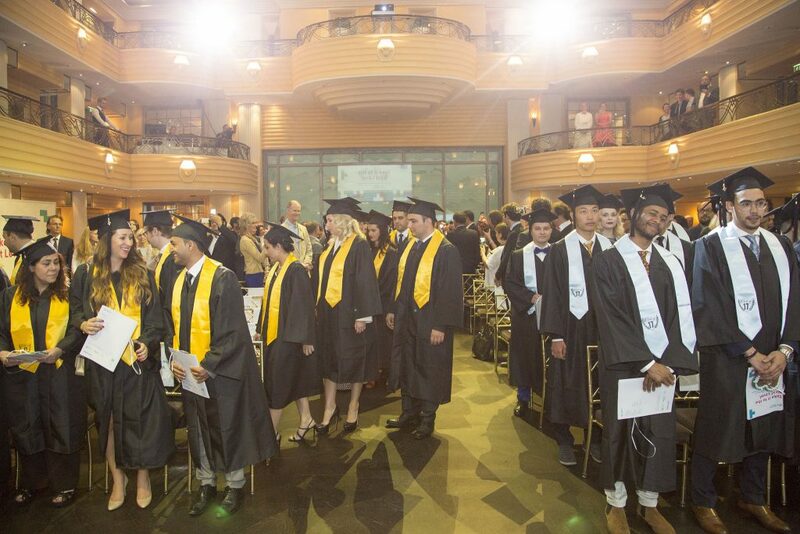 The presentation of the degrees and special awards, where students were individually honored for their academic achievements. 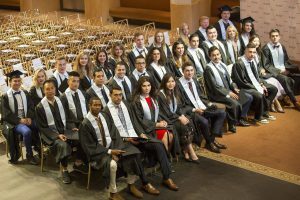 Afterwards, Mishel Abudi, Bachelor of Science (Hons) in International Business and Zacharie Traer, MBA gave the undergraduate and graduate speeches respectively. 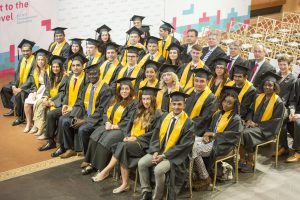 At the conclusion of the commencement ceremony, to the sound of warm applause, students began the second procession of the day, this time to the bar for well deserved cocktails and cava in the ballroom lounge. Lastly, as the evening came to an end, students basked in the merriment of the day, reflecting on past achievements and speaking of accomplishments to come with family and friends, rounding off a memorable day in Munich. 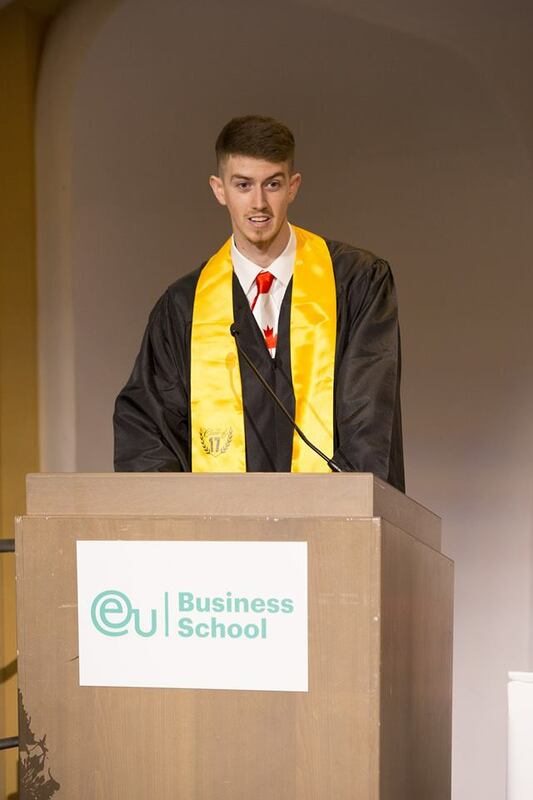 To see more pictures from EU Munich Commencement 2017, click here.